Advertising your business or service on JoinDayo is easy and very affordable. Every business gets a free listing in one category in the town where it's located. We've listed most businesses, so your free listing is probably active already. To see what your free listing looks like, click here. To add or change your free listing, you'll need to create an account. There's no charge to set up an account, so click here to get started! Order your advertising package today, and we'll keep you at this price for as long as you continue to advertise! Our packages require no contract or long-term commitment. You can pay monthly or quarterly. Photos of business, product, service, people. One of our clients talks about how well video works for his business. Photo of business, product, service, people. 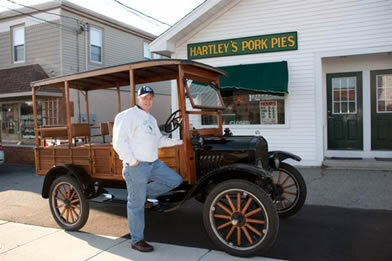 Since 1902 residents of Southern New England have made Hartley’s Pork Pies of Somerset a part of their family routine. Whether its during the week or the traditional Saturday night meal of pork pies and baked beans, delicious Hartley’s Pork Pies are always a family favorite. Hartley’s Pork Pies have been made from the same secret recipe for over 100 years. Now don't be one of the many who have been disappointed by seeing that famous "Pies all gone!" sign in the window. Call ahead to make sure that your mouth-watering pies are waiting for you. Includes Video & Dedicated "Micro-Web Site" on JoinDayo! We have packages custom-tailored to the needs of larger businesses and corporations. Corporate packages can include any of the above features, as well as high-level features such as product ordering, shopping carts, pages that can be edited and changed by your employees, and pages that receive and update information directly from your corporate database. Contact us for more information on how you can enhance your company's current marketing efforts with a corporate presence on JoinDayo.com! To add or change your free listing, or to upgrade your free listing to add any of the above features, please contact us for details. If you haven't created your free account yet, click here.